Hands at Work is currently accepting applications for the 2019 volunteer intake. 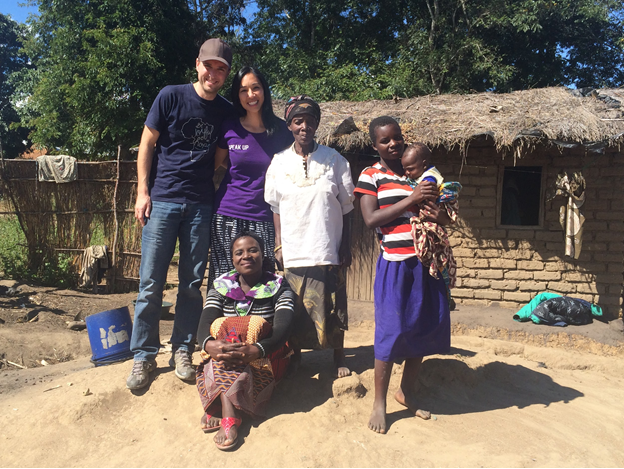 We sat down with long-term U.S. volunteer Michelle Tom, from San Francisco, California, who currently serves in Zambia alongside her husband Marc Damour, who is a long-term volunteer from Canada. If you feel called to serve in Africa and would like to apply to this year's intake go to http://www.handsatwork.org/volunteer or contact: volunteer@us.handsatwork.org. Q: How did you become a Christian? A: I grew up going to church but didn’t understand the depth of God’s love for me at the time. When I became a Christian, God broke an idol in my life: a desire to be in a relationship, get married and have kids by a certain age. I came to realize that God had pursued me through all those years of my rejecting him. It was at Christ Church that I gained a deeper understanding of my identity in Jesus Christ and not of this world. Q: What brought you to Hands at Work? A: In 2012, Christ Church started partnering with Hands after Pastor Toby Kurth went on a Vision Trip to learn more about the ministry. When he shared about how he saw the love of Christ through our brothers and sisters in Malawi serving their vulnerable neighbors, I remember feeling encouraged to do the same in San Francisco. Though I never felt a calling to overseas missions, I wanted to go and see what God was doing in Malawi. In 2013, I joined my church’s team to visit the community of Mcheneke in Malawi. It was an eye opening experience for me. I spent time with Care Workers (CWs; local volunteers caring for their vulnerable neighbors), played with children and did Holy Home Visits (HHVs; visits to the homes of children served by the Hands ministry and their caregivers). On an HHV, I visited a Gogo (grandmother) who was suffering from malaria, which prevented her from caring for her three grandchildren. They lived in a home with no door or windows. The children had a look of despair. I was struck by the vulnerability of the family and left Malawi with a heavy heart, hopeful that the the CWs would bring hope and healing to them through the love of Jesus. That was the beginning of my journey with Hands. Q: When did you feel you wanted to get more involved? A: When I returned to the U.S., I knew that I wanted to stay involved with Hands. Five months after I returned, I was laid off from the small tech company in San Francisco where I was working in Human Resources. I saw this as a blessing in disguise because God had already placed in my heart a desire to go back. I remember feeling a deep sense of peace that it was His will for me. I volunteered with Hands U.S. in the meantime, then during a 4-month visit to Africa in 2014, I felt strongly that God was calling me back to serve in Africa long term. I returned to Africa in 2015 and have been here since. Q: How did your family and friends respond to your decision? A: My immediate family, being Christians, encouraged me in my decision. I felt secure in God’s will, was eager to go, and felt supported by my church, family and friends. Even when I go home to San Francisco, Pastor Toby is very supportive and gives me opportunities to share with the congregation during Missions Highlights about what God is doing in Africa. Q: What are you doing now with Hands? A: I’ve been based in Zambia, in a community of international and local Zambian volunteers who are living out their call for Christ. I’m part of the Finance Team and help support our Bookkeepers at Hands’ Service Centers (SC) in Zambia and the Democratic Republic of Congo (DRC). Q: Have you had the chance to go back to Malawi and visit the Gogo who had malaria in 2013? A: Yes, I’ve been able to visit Gogo Merita every time I’ve returned to Malawi. In 2014, I noticed that the CWs had helped build a door and windows. The children had smiles on their faces, and I could see the impact of the CWs’ regular visits. When I visited the following year, the family had moved into a new home and even had some land. I was able to visit Gogo again this past May with my husband Marc. One of the highlights was watching Gogo reading her New Testament book with such joy. The youngest grandchild who is now 10 years old lives with their CW Rose who is also the Gogo’s daughter-in-law. I was encouraged that so many people are committed to walking with this family through the joys and challenges that they have faced. I continue to pray for them by name and look forward to seeing them again. Q: How do you feel God is using you to serve the most vulnerable in Africa? A: We talk at Hands about the Regional Support Team (RST) building capacity into the SC, which in turn supports the community-based organizations (CBOs) that are comprised of the CWs. I’m not at the CBOs often because my role is primarily in the office, but I serve the most vulnerable by walking with the SC who do. I try to encourage them to have a spirit of eagerness to learn from one another, to live out what God has called us to, and to serve with humility and love. Q: How has your life been transformed by serving the most vulnerable? A: As I continue to grow in my understanding of the depth of brokenness of those who are most vulnerable, I’ve also learned a lot about my own brokenness. I realize that the healing and hope we all need can only be found in Christ and we are united in that. God has also deepened my understanding of the depth of His love, compassion and grace through the example of the CWs and caregivers, and the Hands community. Q: How has it been living and working in community with other International and African volunteers? A: Living in community has been transformative. I’ve learned about my own brokenness and the healing that I need as I live and serve alongside others who are also broken. It’s not our differences that define us but rather the love that God gives us through Christ. I’m grateful to be part of a Christian community with different cultures and backgrounds who has been called together by God. It’s also been amazing to be part of the growth in our Hands communities in Africa and across the world who are serving and advocating. It’s so special to know that we’re united as one family. Q: What would you say to those considering serving with Hands? A: If you feel called, I’d say “Just do it!” Don’t let fear hold you back. Take that step of faith because God can and will do amazing things, and you don’t know how He is going to grow and use you. Of course, there will be challenges along the way, but God is faithful. When we come willing and open to what God is going to do, He will reveal more of Himself. Come without preconceived notions, ready to surrender to God in prayer so that your focus is on Him rather than yourself.